John W. Jones was born into slavery on a plantation in Loudoun County Virginia on June 21, 1817. When he was 27 years old, he and two of his half-brothers along with several other slaves from nearby farms, escaped and made a month-long journey from Virginia through Pennsylvania's rugged mountain passes on foot until they reached Elmira. Finding assistance along the way by stops on the underground Railroad in Philadelphia,Williamsport, Alba, and South Creek, they covered 300 miles. Once in Elmira in 1844, Jones proved industrious and found the favor of several prominent families who gave him work and a chance at education. Within three years of arriving, he served as sexton of the First Baptist Church, which rebuilt a year later a more spacious building. He kept this position until yet a larger church was built in 1890, the present structure which stands on the corner of Church Street and Main Street, when he finally retired to his farm property about a mile north of the church. During his over 40 years as sexton, he lived in a yellow house next to First Baptist, in close proximity with the railroad and Erie Depot. From 1850 on until emancipation, it is believed that he arranged safe passage for at least 800 runaway slaves--men, women and children--on Elmira's northbound trains to Canada. The Williamsport and Elmira line, later called the Northern Central, ferried anywhere from 6-12 people at a time on the 4 AM "Freedom Baggage Car" to the New York Central in Canandaigua, and eventually all the way to Ontario. It is likely he housed these journeying stowaways in his home in between arrival and departure, and his wife Rachel almost certainly fed many mouths in these ten years. Elmira had many Abolitionist-minded citizens who offered aid, among them Jervis Langdon, famed father-in-law to Samuel Clemens (better known as Mark Twain). It is notable that Langdon housed and aided Frederick Douglass in his escape from Maryland in the Autumn of 1838 in his house in Millport, NY, a mere ten miles from Elmira. Simeon Benjamin, founder of Elmira Female College, was another prominent financial contributor to the work. Reverend Thomas K. Beecher, the pastor of the Independent Congregational Church that would come to be known as Park Church, also contributed to the cause. He was brother to famous authoress Harriet Beecher Stowe and orator Henry Ward Beecher. Beecher's Park Church was founded by a desire among its members to further the work of Abolition. The Christian revivals of the 1830s had sparked a religious sentiment into a flame of ardor through Central New York, called the "Burned-Over District", and many Elmirans had been caught up in the blaze of this revival, smoldering within them a desire for social change. John Selover was an Elmira man with ties to Colonizationalist and Emancipationist Gerrit Smith, who aided John Brown's raid on Harper's Ferry. The Underground Railroad and Abolitionist history in Elmira is extensive, and ultimately leads to Emancipation and the Civil War. In the next part of the series on John W. Jones, we will look at his redemptive role in Elmira's infamous history during the period when Elmira housed a death camp for Confederates. Kathy: Welcome, Donna. We are so happy to have you here this week, and that you have agreed to share a bit about yourself and your writing. Donna: Thanks for inviting me! I’m honored to be your guest! Q: First of all—cake, cookies, brownies, or tofu (gack!) ? What a question! I’d have to say Krispie Treats! My husband has become sensitive to wheat so we make Krispie Treats with a variety of marshmallow flavors and sprinkle toppings. They were always my favorite dessert from childhood and they’re quick to make, so I don’t feel like I’m missing a thing by sticking with the Krispies for most of our desserts. Q: When did the writing bug first hit you? Back in 1982. In the early 1980s, news reports came out on TV that the romance genre was exploding and even housewives untrained as writers were getting published. I had a full time job as a technical proofreader, and was formally trained in music, but I was interested in finding out about this fad. Even though I had read very little fiction, I sent for three free Harlequin romances offered for proofs of purchase from Hefty trash bags. They sent out three reprints from the 1950s, British stories. After reading them I wanted to try writing contemporary romances, so I bought myself a new typewriter (yes, my career predates the age when personal computers were common). By the end of that year, I bought an IBM personal computer. By 1984 I had written three romances, none of which ever became published. My fourth story, submitted as three chapters and a synopsis to Thomas Nelson for what was then their Promise romance line, became my first published writing, releasing on Valentine’s Day in 1985. Q: How does New York play into your writing? That first romance for Thomas Nelson was set in a fictional version of my hometown of Brockport, New York, twenty miles west of Rochester. After that, I wrote fifteen historical romances set in Michigan, where I have lived since getting married in 1971. 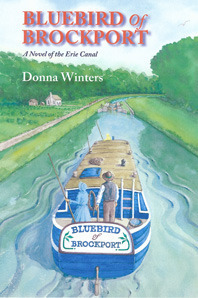 Then, in 2011, Bluebird of Brockport, A Novel of the Erie Canal was released, historical fiction set in Brockport and on the Erie Canal in 1830. Right now, New York stories are the bookends of my career, but my WIP is contemporary women’s fiction set in the Midwest. I’m not sure about the sitting down part. I would ask Jesus if I could walk in his dust. Every editor I have ever had has been a mentor in some way, and a writer friend who passed away in 1993, Hilda Stahl, was also a very important mentor. My editors taught me how to improve my work, and Hilda, an inveterate story spinner, helped me learn to plot. I really felt the loss when she suddenly suffered a cerebral hemorrhage and soon after, went to be with the Lord. 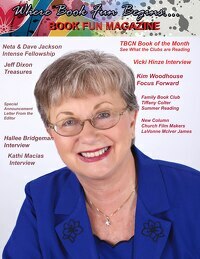 She was only in her early fifties when that happened, but she already had over 100 Christian fiction titles published and/or under contract. I miss her still. I hope readers will grasp the zeitgeist (spirit) of the times in which my stories were set. If you have been to the State of New York, what is your favorite place? If you have not been to New York State, where in the state would you like to visit if given an all-expense-paid trip? Thanks for letting me visit! This was fun! Donna adopted Michigan as her home state in 1971 when she moved from a small town outside of Rochester, New York. 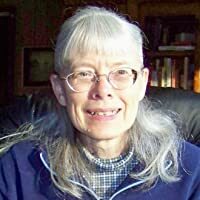 She began penning novels in 1982 while working full time for an electronics firm in Grand Rapids. She resigned from her job in 1984 following a contract offer for her first book. Since then, Thomas Nelson Publishers, Zondervan Publishing House, Guideposts, and Bigwater Publishing have published her novels. Her husband, Fred, a former American History teacher, shares her enthusiasm for history. Together, they visit historical sites, restored villages, museums, and lake ports, purchasing books and reference materials for use in Donna’s research. Donna has written fifteen historical romances for her Great Lakes Romances® series. Recently, she turned her attention to her hometown on the Erie Canal and produced an historical novel, Bluebird of Brockport, A Novel of the Erie Canal, which released as a paperback in June 2012, and has now been offered in Kindle format. Dreams of floating on the Erie Canal have flowed through Lucina Willcox’s mind since childhood. Yet once her family has purchased their boat and begins their journey, they meet with one challenge after another. An encounter with a towpath rattlesnake threatens her brother’s life. A thief attempts to break in and steal precious cargo. Heavy rain causes a breach and drains the canal of water. Lucina comforts herself with thoughts of Ezra Lockwood, her handsome childhood friend, and discovers a longing to be with him that she just can’t ignore. Can she have a future with Ezra and still hold onto her canalling dream? Ezra Lockwood’s one goal in life is to build and captain his own canal boat, but two years into the construction of his freight hauler, funds run short. With his goal temporarily stalled, and Lucina Willcox back in his life, his priorities begin to change. Can he have both his dreams — his own boat, and Lucina as his bride? Thanks again Donna for being with us this week and for sharing about yourself and your writing. I loved the tidbit about the hefty bags and Harlequin books! It goes to show that each one of us has a unique path that the Lord leads us in His plans and purposes. Wishing you all the best as your write for him. Readers, be sure to leave an answer to Donna's question in the comments section below. One lucky commenter will win a copy of her book, Bluebird of Brockport, to be drawn by random.org and announced Friday Jan 25th at 7 PM. You may increase your odds of winning by following this blog or www.fictionaddictionfix.blogspot.com and by sharing this post on facebook or twitter. Hello! I’m so excited to be talking about my new book, “Pride, Prejudice and Cheese Grits”! Wait, did the blogger reader count just slip? I think I heard the sound of hundreds of people quietly clicking past this post. But why, dear ones?? It’s historical and it’s about the Civil War and it’s funny. What can go wrong? Blasphemy? 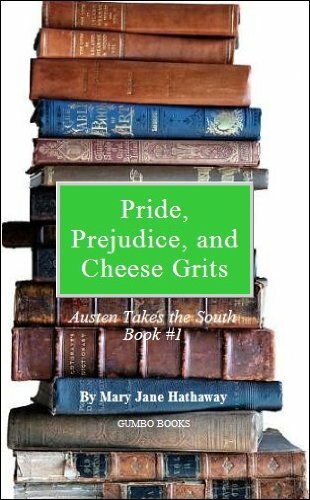 How can cheese grits, that so lowly of the Southern dishes, possibly occur in the same title with Austen’s wit and genius? Oh. I see. Well, let me explain. Like some girls who love romance and historical writing, I am beyond obsessed with Jane Austen. Obsession is for amateurs. Napoleon was obsessed with Josephine. Vincent Van Gogh cut off his ear for that girl whose name nobody can recall. None of those ended well because they were merely obsessed. (Okay, also a bit nutso, to be honest.) Austen fans sprint past obsession and head for the kind of clarity that comes from dedicating one’s entire life to the cause of all things Jane. So, once we’ve established that point of reference, you can start to see how everything relates back to Jane. What Jane Austen thought of eating less than two courses at meal times. What Jane Austen thought of when to wear white. What Jane thought about refusing offers of marriage in a dignified way. (Maybe that last one doesn’t come into play much for a lot of us. *sob*) But still, Jane becomes a guiding force in our lives. We whisper her best lines when we’re too mad to make up our own vicious come-backs. We put down that handful of frosted flakes and pick up a blushing red apple. We take time out from the endless e-mail and Twitter and facebook to arrange some flowers because that’s what Jane would do. So, it was a little annoying to have Jane’s best lines running on a loop in the background of my mind. I fought it mightily, drowned it with noise, and doused it with scads of NYT bestselling historical thrillers that made no sense and were completely inaccurate. My brilliant heroine, a Civil War historian from a town named Flea Bite Creek, was good enough, right? Who needed Austen to muddy it up? She was still there. Sometimes arching a brow, sometimes hiding behind a book, but mostly laughing at me. So, I started to write each chapter by getting my Jane quote out of my head and onto the page. I wanted hero and heroine to have a great big nasty fight? “I could easily forgive his pride, if he had not mortified mine.” Natch! Wonderful! The book was finished!! I promptly removed all the Austen quotes and set about editing it. Polishing and cutting and slicing and dicing. Ow. Owie. YOW. But it had to be done. Now it was a nicely sized novel, 300 pages, fun to read and ready to be submitted. But it was missing something. I fiddled and rearranged and sulked and grumped. The book was no good. Not without Jane. Not without her subtle (and sometimes not-so-subtle) wit and sense of irony. Certainly not without her as a compass for my story, when I use her as a compass for my living. So back in she went. And from there I heard from dozens of agents, scores of editors and a handful of publishers that this book would never sell. And mostly, I love Austen. I love Pride and Prejudice. I’m beyond ‘love it’ all the way into the ‘I think I would have to marry this book if it wasn’t illegal’. So, that’s the story of how ‘Pride, Prejudice and Cheese Grits’ came to be written, and rejected, and resurrected by the good folks at Amazon. Bless their little hearts, letting us digitize any random thing! Yee-haw, my friends, that means more books about subjects we love without all the naught bits! I hope you enjoy my little slice of Austen mania. The next book in the series, ‘Emma, Mr. Knightley, and Chili-Slaw Dogs’ will be coming out in May 2013. Until then, my sweets, stand tall in whatever particular form of genius (not craziness, NOT!) your historical literature obsession brings you! BIO: Mary Jane Hathaway is the pen name of an award-nominated writer who spends the majority of her literary energy on subjects un-related to Jane Austen. A homeschooling mother of six young children who rarely wear shoes, she’s madly in love with a man who has never read Pride and Prejudice. She holds degrees in Religious Studies and Theoretical Linguistics, and has a Jane Austen quote on the back of her van. She can be reached on facebook at her regular author page of Virginia Carmichael (which is another pen name, because she’s just that cool). Book blurb: Shelby Roswell is a history professor on the fast track to tenure until her new book is crushed in a review by the famous historian, Ransom Fielding. She struggles to regain her momentum only to discover that Fielding has taken a visiting professorship at her college. The place that was once a refuge from the poverty of her past is now a battlefield of Civil War proportions.